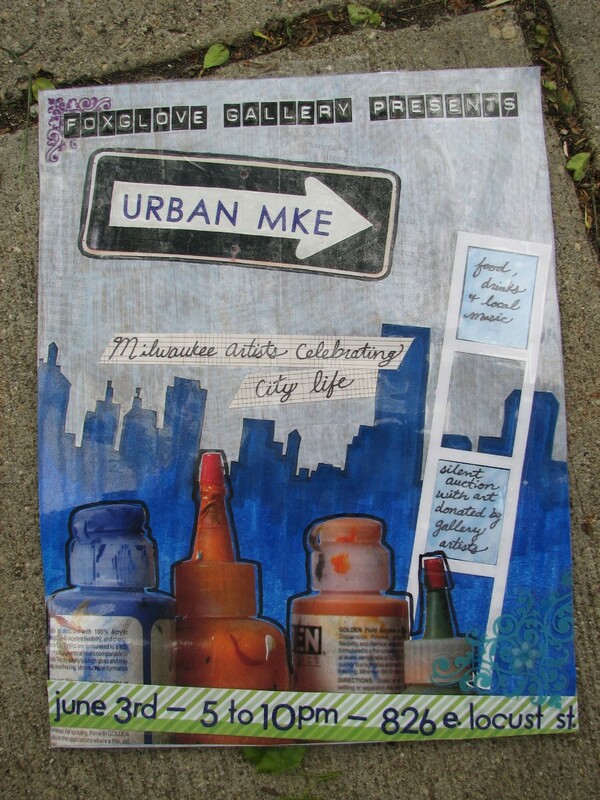 Our next Gallery Night/Fundraiser, Urban MKE, June 3rd 5-10pm! Featuring Environmentally Themed Sculpture, Glass, Art Books, Zines, Monoprints, Print series. Come have some fun in the park with your friends at Foxglove Gallery!! You don't want to miss the live music, The Yum Yum Falafel truck, live painting, hoola hoop lessons, henna, and a free market!! The following information and event guidelines are for registered vendors. 1. Set up time is 9am Sunday June 5th. 2. The fee for the tables and spaces are non-refundable. 4. You must furnish your own change. 5. Foxglove Gallery reserves the right to refuse any vendor’s product or service. 8. In consideration of other vendors and patrons, please do not break down your booth until 7:00PM. 9. If you sell something that requires a permit, it is your responsibility to obtain the permit. 10. Each vendor is responsible for any insurance coverage for the protection of the vendor. 12. The vendor assumes responsibility to pay all federal, state and local taxes, duties or assessments that may be levied or imposed on the vendor’s operation, services, transaction, revenue and property. 13. In consideration for entry as a vendor, the vendor does hereby, release, remiss, forever discharge and agree to hold harmless Foxglove Gallery and all members of, from any and all manner of action, causes of action, suits, charges, claims, demands and liabilities of whatever kind of nature to include death, personal injury and/or property damage whether due to accident or negligence which arise during the course of this event and further covenants not file a claim for such death, personal injury or property damage. • Booth spaces to measure 10 ft. deep and 10 ft. wide. • tables, chairs, and any other display materials to be provided by vendor. • Trash receptacles will not be provided so please bring your own and collect your own trash at the end of the Craft Fair. • Electricity is not available, if you need it please bring a generator. Check back soon for more information about movie nights, game nights, demonstrations and classes! Email for information about holding your group's meetings at Foxglove Gallery!